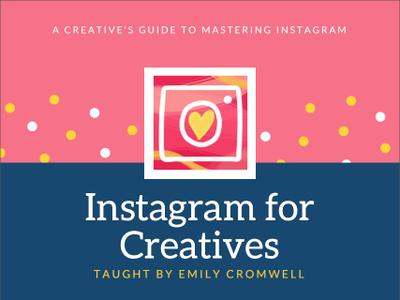 Join Emily Cromwell and learn how she masters Instagram as a creative! She covers several topics such as what to post, how and what hashtags to use for your particular craft, how to create a killer profile, and much more. In this class, you will learn how to craft a profile for your Instagram that is true to you and lets your viewers know just who you are, how to craft a consistent feed that speaks true to your brand and vision, how to edit your photos for a beautiful Instagram feed, the art of engagement, how and what hashtags you should be using (and how to add them to your posts in a way that it won't look all jumbled together), and lastly, how to schedule and make a plan for your Instagram posts. This class is perfect for anyone who is a creative person and is either just starting out on Instagram or has been on Instagram for awhile but wants to learn how to amp up their profile and Instagram game! By the end of this class, you will feel much more confident when it comes to Instagram! Page created in 0.284 seconds with 37 queries.